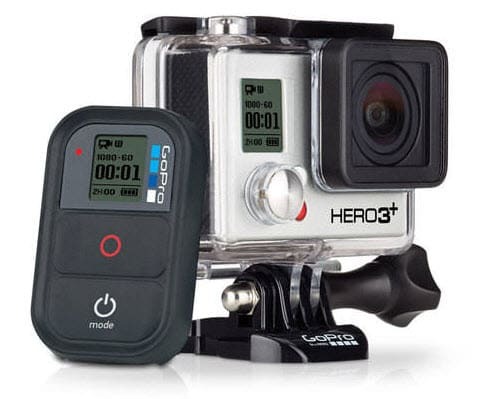 GoPro continues to deliver high quality products and the GoPro Hero 3+ Black Edition camera is no exception. This action camera offers flexible video mode & recording thanks to its SuperView feature which allows you to capture footage at a resolution of 1080P with 4:3 aspect ratio resulting into a sharper definition in an immersive wide-angle perspective. Another amazing feature is the New Auto Low light mode which allows you to capture excellent footage in rapidly changing light conditions. It also boasts of 30% longer battery life compared to its predecessor, 4× faster WI-Fi, improved audio quality, powerful photo capture at 12MP with speeds of up to 30 F/s and so much more. The Drift HD Ghost S is the only cation camera equipped with a wearable on-off remote control which allows you to take photos or change function modes from a distance of 10 meters. Its in-built LCD screen is protected by Corning Gorilla glass which is scratch-proof even in the most rugged of terrains. That’s not all, the Drift HD Ghost s has a uniquely designed water-proof housing which allows it to capture footage underwater with depths of up to 180 feet without a case. If you are not awed then wait for this; did you know that the Drift HD Ghost allows you to shoot vibrant and clear still photos while you’re filming? Definitely a big contender to the GoPro. How does the idea of live action via HDMI sound? Well with the Replay XD 1080 all this is possible – stream or record you video simultaneously on or to a transmitter/ external HD recorder. The Replay XD 1080 is arguably the smallest and simplest action camera with finely tuned optics boosted by its f3.1, wide-angle 135º lens and anti-glare coating which allows for minimal image distortion and HD pictures full of color. It also features a rugged and water-proof aluminum housing for the extreme user. Just mount or rotate, tilt, swivel and clip it on place and you’re ready to roll. Yeah it looks like a GoPro and it has many similar features as the GoPro.. but the Toshiba Camileo X-Sports has a few unique amazing features up its sleeve. First is the Upside-Down mode which delivers your photos and videos right-side up even if the camera is mounted the other way. Next is the electronic image stabilizer which ensures that your footage does not look shaky. Its 10 * optical zoom facilitates ease of getting close to pictorial targets. With a battery life of 5 hours, the Toshiba Camileo X-Sports allows you enough time to capture those exciting exploits be it underwater (maximum depth of 60 feet as long as its water-proof casing is on), on the road, snow ow wherever you might be. 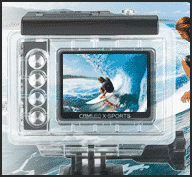 GoPro 3+ – Drift HD Ghost S – Replay XD1080 – or, Toshiba X Sports ?